Eyebrows shapes are often taken for granted. Mostly every other girl out there; aims for the perfectly arched eyebrows, but do you know that eye brows should be groomed according to your face shape as well. Round face shape is has the same length and width. To make the face look longer, always aim for highly arched brows. Oblong face shape is longer in length, so never go for arched eyebrows as it will make the face look even more longer. It is best to stick to some what flat lashes. Triangular face shape looks best in thing and longer lashes. You may extend the edges using an eyebrow pencil or pomade. Diamond face shape has wide cheeks and forehead, therefore it is best to stick to Rounded Eyebrows. A Square face shape has a forehead that is wider than the chin. The face tapers towards a narrow and oval chin. Choose a thick eye brow shape with soft angles, as it makes the face appear longer. Just Like Diamond Face shape, The Heart face shape also has wide cheeks and forehead, so Rounded eye brows are the best option to balance the out the wider cheeks and forehead. Oval face shape is considered to be the most ideal face shape so an eye brow shape has minimal effect on how the face shape looks. It is best to go for softly angled eyebrows. The soft angles go straight up and then gently curve round at the top and down. Step 2:Softly fill in any sparse areas with a pencil or brow pomade. Select a color that best matches your brow. 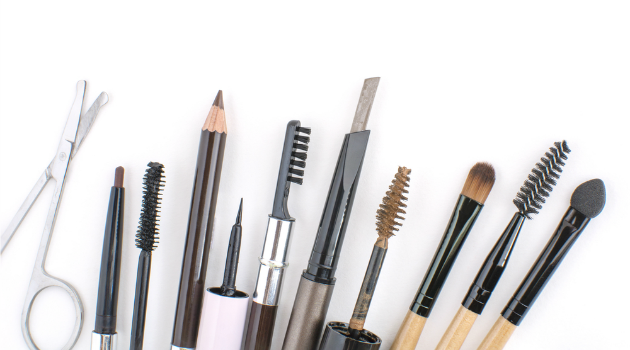 Step 3:Brush the brows again with a Spoolie to soften any harsh lines. Step 4:To seal the look, comb through brows with a colored or transparent gel. Step 5: Trace around the perimeter of the brows with a translucent powder or concealer, to make the edges look more neat. No eye makeup is complete without the perfect brows! What do you think? Let us know.